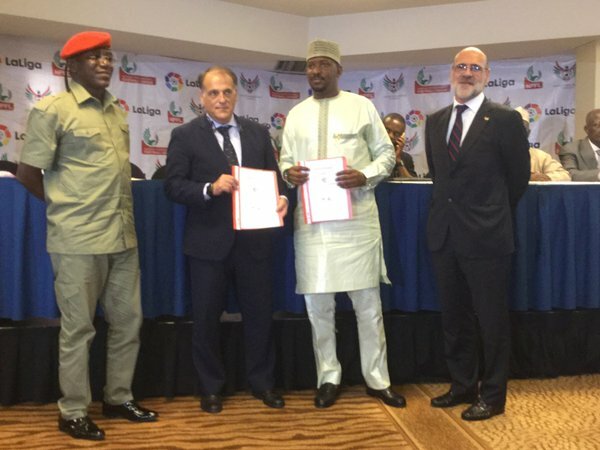 Representatives of the governments of Nigeria and Spain witnessed the landmark signing of a Memorandum of Understanding (MOU) for a five-year technical and commercial partnership between the League Management Company of Nigeria (LMC) and the Spanish League Board (LFP). LMC chairman, Shehu Dikko, signed the agreement on behalf of the body, while President of La Liga, Javier Tebas, signed for the Spanish League. Dikko said the partnership agreement will help improve the quality and fortunes of of the Nigeria Professional Football League. “We are pleased to be leading the reforms and to achieve that, we decided to align with global best practices by emulating those doing things well and right,” Dikko said in a release made available to. “We have a lot to learn and benefit from the La Liga and we believe that the LaLiga also has some things to learn from us. “There is a fight for the heart and pocket of Nigerians to love and buy into our domestic football league and La Liga is ready to work with us on that. “Stakeholders are already getting interested as they have seen one of the best leagues in the world associating with us. The partnership agreement which will run for five years in the first instance will focus on key areas of capacity development, training for coaches and club administrators; inter-club exchanges and commercial activities including joint marketing.